I’ve had the recent pleasure of lively twitter debate with Phil Carney (@carneycapital) about bitcoin. His exploratory post, “Debunking Bitcoin“, is filled with the usual newbie (and gold-bug) criticisms, and I’m always more than happy to debate and debunk misguided or misunderstood ideas. I think Phil and I mostly understand each other at this point, but this is a bigger discussion than can be done 140-characters at a time. With a background in both economics and computer-science, bitcoin is a bullseye for me intellectually. It’s often difficult for those without such dual perspective to grok something as complex as bitcoin quickly. But that’s why we have blogs and twitter. Phil lays out several “problems” with bitcoin which lead him to the conclusion that it “IS another form of a fiat currency, albeit a digital one that is decentralized.” His main concerns, somewhat typically boil down to: “No Intrinsic Value”, “Divisibility”, and “Alt Coins”. I’ll debunk these one at a time. But It Has No Intrinsic Value! 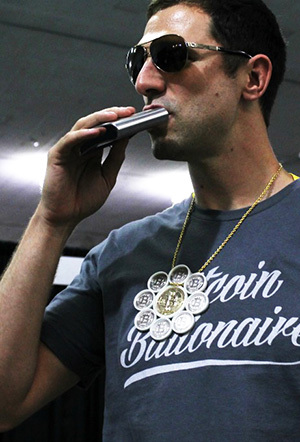 He’s right that you can’t make bitcoin into jewelry (or can you?) or use it in industrial processes. But what he and many gold-bugs miss is really why things have value in the first place. It’s simple: things have value because people want them. Usually valuable things are useful. They allow people to get something done, or get something done better. In the case of dollars, gold, and bitcoin, they all allow people to exchange goods and services more easily. They solve the coincidence of wants problem. They reduce the friction of exchange. This is what money is all about. In our internet-connected lives, we need to send money electronically. Increasingly little of our day-to-day exchange is done by handing over physical paper-cash or metal-coin. We exchange online, usually with electronic dollars administered through some third-party account (our bank, a credit-card processor, paypal, etc), with the 3rd party taking a cut somewhere in the process. Bitcoin is exciting because it’s the first thing to be able to do electronic exchange reliably without a 3rd party. It is electronic cash. No central body controls or issues it, and no 3rd party is explicitly involved when someone sends bitcoin to someone else. It also provides real transactional security, unlike easily-intercepted credit-card numbers and bank account numbers. And it is credibly scarce, with a mathematically limited supply (more on this later). All of these properties make bitcoin very useful for our modern way of life. It is specifically useful at reducing the friction of exchange. Why? Because it requires no middleman, offers effectively instant settlement, negligible transaction cost, and it is both reliably scarce and cryptographically secure. These features add up to a near-ideal tool for facilitating online transactions. And that’s what money is all about – specifically reducing the friction of exchange for however a given culture desires to exchange. In the past, it was face-to-face. Now we want to transact instantly, across oceans, at near-zero cost, with confident security. That is bitcoin’s “intrinsic” value. There is no need to melt or wear it for it to have utility in our lives. In sharp-contrast to a gold-bug’s sensibilities, it is bitcoin’s non-physical nature that allows all these benefits. In modern times, tangibility is a bug, not a feature. Ok, Bitcoin is useful, but there are a gazillion units! It’s not scarce! 1) Anyone who controls one bitcoin, will always control all divisions thereof. It’s like owning an ounce of gold. The owner can split it down to gazillions of individual gold atoms, but he still just has one single ounce of gold. No more gold has been created. Gold is no more scarce because each ounce can be divided into 10×10^27 individual gold atoms. 2) Perfect divisibility is a strength. It allows further precision in economic transactions, and that reduces friction. If I want to sell something for 1.23456789 bitcoin, I can do that trivially, with perfect precision. Try dividing an ounce of gold to a one-hundred-millionth of an ounce…without a state-of-the-art chemical lab.­ While this may seem academic, it will likely prove a major benefit in allowing bitcoin to flower into an underlying protocol layer doing the heavy-lifting for additional services requiring very detailed asset-registers (see Naval Ravikant’s excellent The Internet of Money for starters). Divisibility is a feature, not a bug. But anyone can create new crypto-currencies! “Put simply, as time evolves, as more crypto currencies enter the virtual currency space, the Bitcoin phenomenon and hysteria may be eroded. Whilst it has dominated the virtual currency space, Bitcoins 2.1 quintillion [sic] bit supply may be finite to Bitcoin itself, the space for new virtual crypto currencies is growing. Phil is right that anyone can create a new crypto-currency (go make your own here. See how well it catches on…). But he ignores the question of why anyone would use it. Why did humanity use gold as our primary monetary instrument and not silver? Or copper? The answer boils down to concepts familiar to those studying tech adoption or social sciences: network effects and first mover advantages. When some convention or technology (or monetarily-appropriate metal) is adopted by enough people, it’s advantageous for everyone if the next person in line also adopts that convention. The new guy gets the benefit of exposure to the rest of the network, and the network itself expands, enhancing the value proposition for all existing participants as well as the next entrant. As long as no vastly superior new convention appears, new entrants are highly incentivized to use the existing status-quo. Like core internet protocols (IPv4, TCP, HTTP, SMTP), bitcoin is demonstrating strong and likely unstoppable network effects. UPDATE: Erik Voorhees eloquently addresses these points as well, in his open-letter follow-up to his appearance on Peter Schiff‘s radio show. So what *if* something better comes along? Well, we can look to adoption of previous technological protocols, specifically internet/networking protocols. New ideas appear continuously – just look at the list of internet RFCs – yet the internet essentially functions the same way as it did 30 years ago; ie, on the same core protocols. Generally speaking, new services are built atop the core, with core protocols evolving and incorporating new features as needed. This dynamic is already emerging in bitcoin, with Bitcoin Improvement Proposals serving as bitcoin’s RFC equivalent. By far the overwhelming tendency on the internet has been for the protocols to be evolved as needed, and it will likely be the same with bitcoin. For open systems on which infrastructure is built by diverse sets of individuals and companies, all spending their own energy on engineering, education, and process, it makes far more sense to evolve than to switch. Part of the critique of this aspect of bitcoin, most typically from gold-bugs, stems from a fundamental lack of appreciation for how flexible and malleable technology can be. Bitcoin is not MySpace. It is far more fundamental, like the core packet-switching ideas that have underpinned computer networks since inception. In the past 30 years, the basics of packet-switching have been rapidly extended, patched, evolved, and layered on top of extensively. Bitcoin is equally fundamental, open, and extensible. As with gold, malleability is a feature, not a bug. Phil’s arguments are reasonable and fairly typical of non-tech gold-bugs. They fail to appreciate the dynamics and flexibility of technology; both how “real” and “hard” it can effectively be, as well as how beautifully malleable. Much of human interaction is moving to digital realms due to the friction-reduction and efficiency that it offers. The same is now happening with money, courtesy of bitcoin. - If you liked my article, you may leave a bitcoin tip! - If you wish to leave a tip in gold, I guess we can meet-up in person? - I do not accept tips in dollars, Euro, Yen, or any other fiat currency.